An undiscovered treasure, the Maui Kai Resort was the first resort built on Kaanapali beach and is as close to the ocean and beach as you can get in Hawaii. 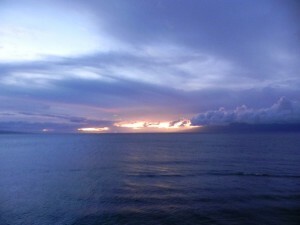 From this western point on Kaanapali Beach, you have panoramic views of the Pacific Ocean and the beautiful nearby islands of Lanai (to the south) and Molokai (to the north). Unit 608 is a spacious one-bedroom air-conditioned corner unit with expansive views from all rooms. It is newly remodeled (Spring 2014) and will sleep six, including a unique Murphy bed on the enclosed lanai. During whale watching season (December through April), you can see the whales directly from your lanai. If you are in the mood for a quick swim, from the front door of Unit 608, you are about 25 steps away from the Pacific or the heated Maui Kai pool.